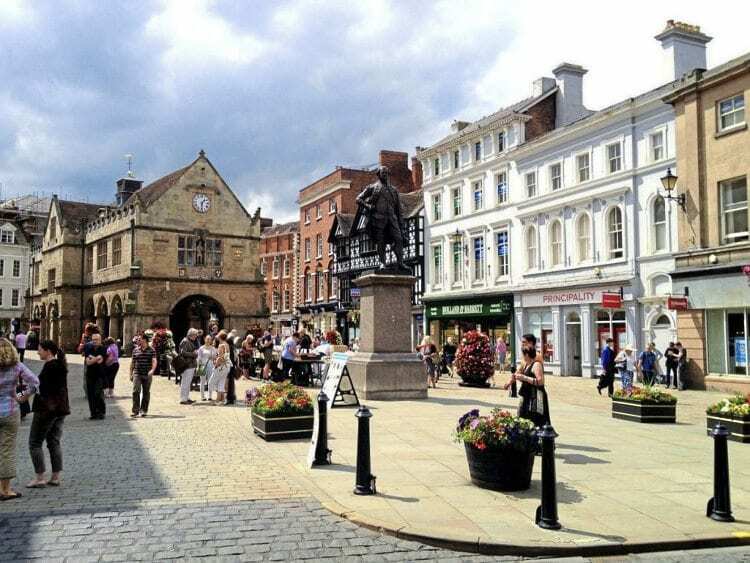 This is an ideal late-summer day out, offering you a choice of three top-notch destinations, namely Shrewsbury, the Welshpool & Llanfair Railway or Ironbridge and Blists Hill Museum. If there was ever a tour that could claim to offer something for everyone, surely this is it! There is a wide range of joining stations too, in Hampshire, Berkshire, London, Hertfordshire and Bedfordshire. The train travels from Basingstoke, Reading and Slough, picking up at Ealing Broadway before skirting London via Acton and Brent. We then make further stops at St Albans (for M25) and Bedford. Our journey is then via the Wigston South Curve, Nuneaton, Water Orton, Sutton Park, Walsall and Wolverhampton to arrive at Telford Central and finally Shrewsbury. Is it pronounced ‘Shroozbury’ or ‘Shrowsbury’? It’s not worth worrying about as even people who live here can’t agree. What can’t be disputed is it’s a really delightful place, famous for its beautiful gardens, its frontage on the meandering River Severn and of course for its connections with its most famous citizen, Charles Darwin. There’s a great range of shops and plenty of welcoming bars and cafes, and the river cruise is especially pleasant. The station is not far from the centre, so it really is an ideal place to while away an afternoon. You will have four and a half hours to explore. Coaches meet the train at Telford Central. Our first stop is in the village of Ironbridge, where you can see and walk across the famous bridge that has come to symbolise the Industrial Revolution and its birthplace. We then rejoin the coaches for a very short journey to Blists Hill Museum, a re-created Victorian town. Here, you’ll experience what life was like when Britain ruled the world. 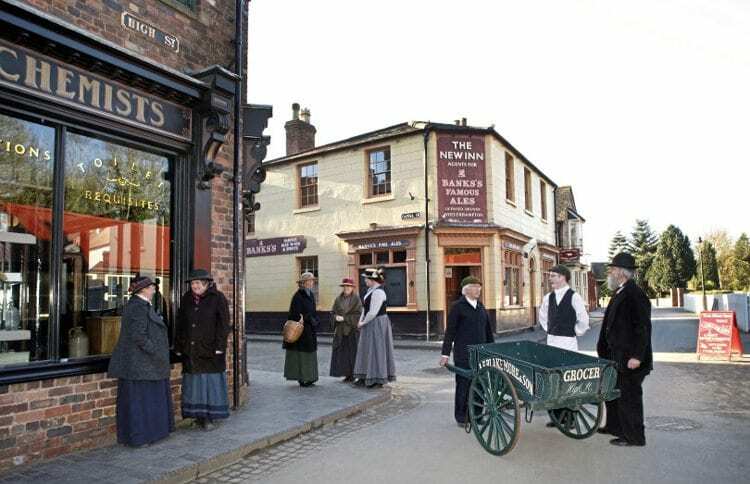 Meet some (almost) real Victorians in their authentic shops and cottages, buy curious goods from a bygone era and watch tradespeople in action in their atmospheric workshops and factories. You will have around two hours here before returning to Telford to reboard the train home. Our coaches take us over the border to the market town of Welshpool, where we find the Welshpool & Llanfair Railway. 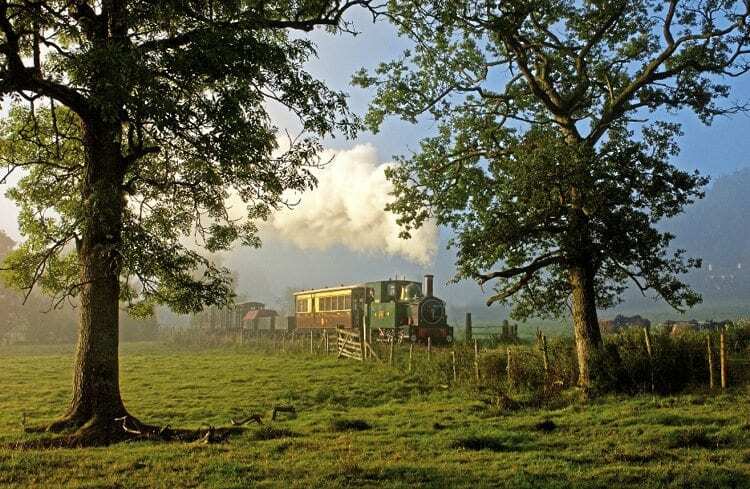 Opened in 1903 to link the town of to the rural community of Llanfair Caereinion, this narrow gauge steam railway is one of the most engaging of all the narrow gauge lines in Wales. From the window the observant passenger may spot the occasional heron, woodpecker or buzzard. As the train runs through the Powis Estate, pheasant and deer can be seen and everywhere a wide variety of wild flowers. The line follows a river valley, twists round a mill and runs through the middle of farms. The train takes 45 minutes to cover the eight-mile journey to Llanfair Caereinion – there is certainly no hurry! This was how our great grandparents travelled and it is a real pleasure to be able to enjoy it all today. The far end of the line, Llanfair Caerinion, is a picturesque little station with a cafeteria and shop and you’ll have time to stretch your legs and take photos before the return journey. Next Post:The premier heritage festival in the southern hemisphere – Stars of Sandstone 2019.